Building a strong leadership culture brings out the best in all of your leaders. Churches are generally great at helping people live out their general calling, but it takes high intentionally to grow people within their special calling. What is God’s calling for you, in this life stage, at your location, with your circumstances and your specific gifts and talents? There are only two questions a church should ask: What is our process for making disciples? Is it working? How does your church help every member understand and live out their unique identity? There is a distinction between a person’s calling and their vocation. Churches have an opportunity to shift the leadership culture from “What do we want from people?” to identifying and releasing people to live into their call. How can the church be viewed as a place where strength, skill, and expertise help it become a disciple-making training ground for everyday life? The church can and should be the training ground for gospel-centered life design. What if your church had the reputation of developing called people to such a degree that marketplace leaders look there first for new employers? What is gospel-centered life design? What does that look like in the church? If we are going to ask questions about our identity, we must ask them in the context of our creator and His unique design for us. Our calling is revealed over a lifetime when we see God’s shaping of our life as discipleship. Learning how to listen as leaders is often more important than learning how to speak. You can make better decisions by asking questions out of security and peace. Questions from your other leaders are not necessarily those people questioning you. Strength and vulnerability are twin ideas, not opposites. Productivity looks different in different seasons of life. Sometimes just getting the chores done is the highest form of accomplishment. Success should be measured less in how much money you make and more in how you live out your unique life call. When people get an insight into the power of their call and begin to live in it, they have an even greater idea into the calling of the church. How can personal clarity within your congregation engage the organizational clarity of your church? When the people receive the gift of calling, it makes it easier to obtain and engage the leadership pipeline of the church. Take the long view, there should be a sense of urgency in your work, but urgency shouldn’t lead to panic in the system. God wants you to be a whole healthy person, as much as He wants you to be a productive, intentional leader. 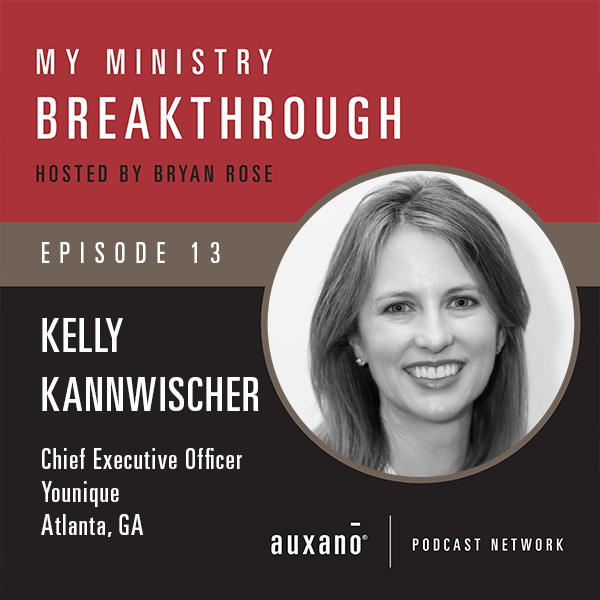 Kelly Kannwischer has spent her vocational life as a not-for-profit executive, consultant, and development professional. Before becoming the CEO of Younique, Kelly founded OptUp Consulting, served THINK Together as the Chief Engagement Officer, and led Vanguard University as a Vice President and President of the Vanguard University Foundation. Kelly graduated from the University of Virginia and earned her Masters degree from Princeton Theological Seminary. She is married to Rev. Dr. Richard Kannwischer and is the proud mother of two teenage girls. When God says “I am doing something…” words begin to create worlds. Learn why nobody wants to give their life away to show up and help somebody find a parking space. Why serving on a hospitality team is a lot of fun for about three weeks but becomes a lousy hobby if there is no substance. If all we are calling people to do is show up to check off a box, they will only be excited for a short time. Train for this instead. How vital is a welcoming ministry in a church where there is so much emphasis on the gospel and missions? Is a First Impressions ministry essential? Answering this question with the Gospel is critical, here’s why. Could it be that there roles in the church that we are presenting as family chores? Serving should never feel like taking out the garbage. There are plenty of opportunities to offend people and make them uncomfortable when you see with first-time guest eyes. We can do everything possible to make 60-75 minutes inside the worship service flawless, but if we are not thinking through what somebody sees first, it may not matter. Do we need to ask – what do they see first? Make sure that the messages from the stage hold up to the messages on the sidewalk. The gospel is offensive but nothing else should be, especially your welcome. Guests far from God may disagree with points of your sermon, but they cannot argue with the love of your people. There are all kinds of offenses on a Sunday that we can fix… the gospel is one offense we shouldn’t try to fix. If we make it feel like we love people, we planned for them, and we cannot wait for them to come back, people hostile to the gospel will eventually take hold. Helping people understand the purpose behind needed changes is critical to keeping volunteer hearts engaged. The why behind The Summit’s hospitality begins and ends with the gospel. The big win of the weekend is that everyone hears the gospel communicated. The Summit First Impressions Plumbline: The why is more important than the what. The Summit First Impressions Plumbline: Everything speaks. The why has to be more caught than taught. People should understand what matters most beyond just hearing words at a training meeting. Leaders must be present and in conversation to ensure that culture is stewarded well from campus to campus. Stories are the most significant indicator of cultural health. Asking guests about their experience is a way to hear from guests and listen for systemic issues in your hospitality experience. The first time guest experience is a health indicator for the entire church. Stats don’t grab people’s hearts the way stories do… tell stories to motivate and to cultivate the results you want to see. Gospel discipleship in every ministry means that people can move from parking cars to planting churches. The majority of guest services conversations are transactional, but are your people available to connect beyond the welcome and into the relational? The bare minimum number of volunteers result in the bare minimum number of gospel experiences. You always need more volunteers – more people engaged in the mission creates more opportunities to engage people. There has to be a passion for the guest experience… your volunteers need to see welcoming people as more than just family chores. Nobody dreams of being a guest services pastor, but the reality is that Biblical hospitality is a critical component of following Jesus. Guest Services are a biblical virtue expressed on an organizational level. We don’t always need to learn something new; we need to revisit the truth over and over again. Leaders sharpen their tools by reading – and not just leadership books. You can engineer EPIC moments to engage First Time Guests. Relax… let go of the perfect plan and the ideal event. Outside of salvation, there are very few things in ministry that are as life and death as we think they are. We can sacrifice people on the altar of our idol the plan. We are not here for the plans we are here for the people. 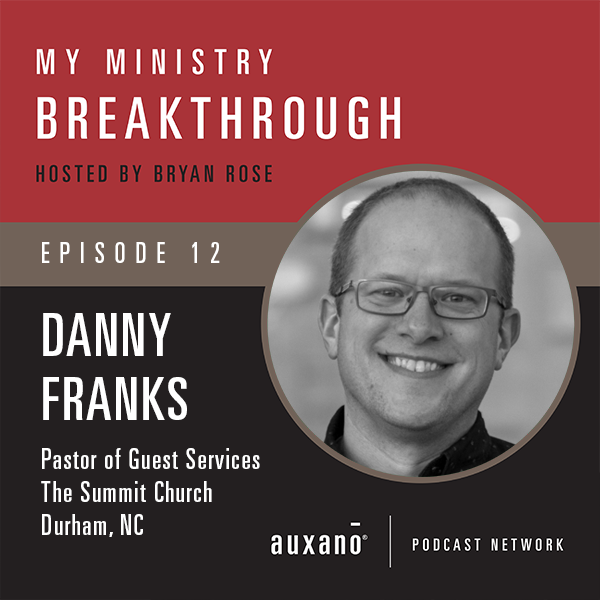 Danny Franks is the Pastor of Guest Services at the Summit Church in Durham, North Carolina, where he’s served since 2003. In that role, he oversees guest services for ten campuses across the Triangle region of North Carolina, reaching over 11,000 people each weekend. He’s married to Merriem (out of his league), dad to three boys (cooler than he was at their age), and protector of one princess (cute as a button). Danny’s passion for the church is to help outsiders become insiders, and challenging insiders to reach outsiders. He is the author of People Are the Mission: How Churches Can Welcome Guests Without Compromising the Gospel, which released in March 2018. He’s a regular blogger at dannyfranks.org and a regular twit @LetMeBeFranks. What does church planting look like 30 years in? How does a church move from program driven to presence driven after years of ministry success? It’s possible to go deep with your weekend sermons and still be responsive to those who are not in a relationship with Christ. If someone is visiting your church these days, they are looking for something meaningful, do not hold back on the presence of the Lord in worship. Pastors, you can teach for maturity and still talk toward salvation. Listen to your desert – when the desert is happening in your heart, the Lord wants to teach you there. You can be a balanced church in the Word and the Spirit. It is possible to be charismatic without being weird. Never be without a swing coach, you need somebody who knows what you don’t and sees what you can’t. We are the only church in the world that has our mission statement, and that is how it should be. Your mission should roll off your tongue with excitement and speak life in every word. What does it look like when a church truly believes Jesus came to break the chains that are still holding you? Is there life in every word and passion in every syllable when you speak the mission? Leadership gets tough when you are not clear on the mission that God has called you to. Why is it important to have your team in the room when developing the vision, isn’t it easier to do it on your own? What does visionary collaboration look like? Collaboration builds a team that will fight for your values and your culture, not just own it because they are told to or paid to. We shouldn’t be afraid of surfacing the misalignment on the team. Don’t be afraid to find out if you have someone on the team who doesn’t share the vision. What does it mean to cast your faith forward and your fear backward? In staff transitions or seasons of change, the tendency is to cast our fear forward instead of casting our faith forward. Your fears can keep you stuck. Making the church planting shift – here’s one pastor who would instead look back at 20 pastors he raised than 20 locations that lower a screen. What is the difference between a church planter and a campus pastor? What happens when the multisite model becomes an obstacle to pastoring in the local context? What might a hybrid model of church planting and multisite campusing look like? Be who you are not who someone else is. Do not deny who God has called you to be. Spend time with the Lord in personal practice, not pastoral theory. If you were not a pastor, would you still live as you live? Refuse to sacrifice your family to lead your church. Are you the same person at home than you are on the stage? Live out of your heart what God has called you to live and your legacy will take care of itself. 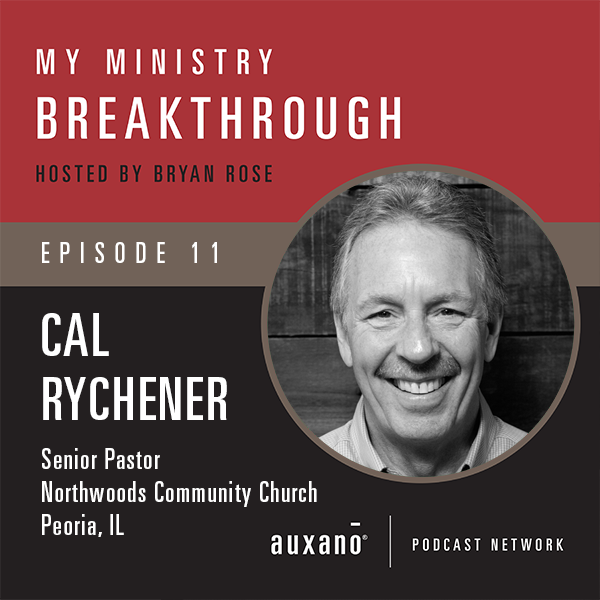 Originally from Archbold, Ohio, Pastor Cal Rychener graduated from Fort Wayne Bible College and went on to earn a Masters of Divinity degree from Trinity Evangelical Divinity School. In addition to his love for the local church, Cal has two other great passions. First and foremost are his wife Susan and their family: Kathryn, Andy, Avery, Madilyn and Blake Rogers; Jonathon, Michaela, Arianna and Joanna Rychener; Victoria and Kody Pinson; and Nathan Rychener. Running a distant second is his love for the Green Bay Packers, for whom he has been a guest chaplain. He has been the senior pastor of Northwoods Community Church since its beginning in 1990. Cal is also the author of the books Living at a Higher Level of Faith and God Can.